Tim and Scott may not be able to turn water into wine, but one of the great advantages of being Supreme is the ability to change Tuesday into Monday. 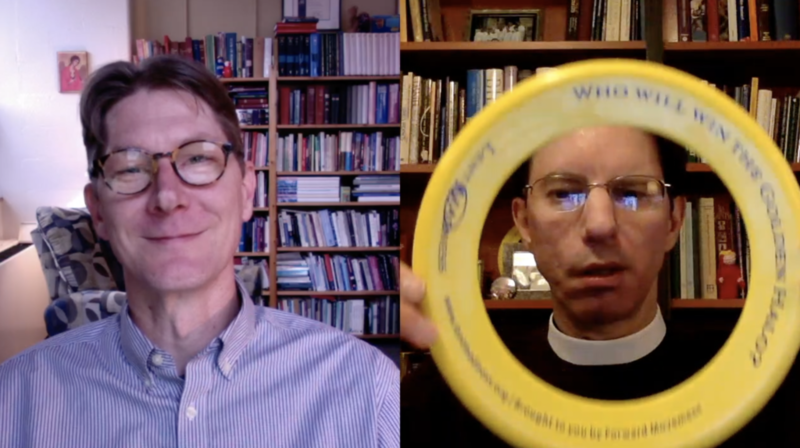 Because yesterday was a holiday (celebrating Martin Luther King, Jr., prophet and sometime Lent Madness competitor), Tim and Scott are releasing Monday Madness on Tuesday. Yes, folks, we are entering Lent Madness high season. Ash Thursday is February 15! Which means you can now look forward to weekly videos to put you in the Lenten mood and prepare for the Madness that is to come. We suggest you dim the purple lights and head over to the bracket page of the website to find out who’s in this year’s competition and when they are competing. You can study the saints on Wikipedia, in your public library, or by wandering through European cathedrals. Of course, we would be remiss if we didn’t also tell you about the fabulous Saintly Scorecard. It’s a steal at just three bucks. You can buy them in bulk for $2 each, and if you buy 30 or more copies, they’re just a dollar each (sold in sets of 10). The scorecard is also available for your favorite e-reader (Kindle, Nook, and iBooks). You can also either print your own personal bracket or buy a giant bracket poster. Whatever you do, make sure you’re getting ready for Lent Madness! 14 Comments to "“Monday” Madness — January 16, 2018"
Well, it’s nigh onto the event of the year-LENT MADNESS and am I ready? Of course not. Ash Wednesday is fast approaching so I’d best hustle and get a move on. Power to the Padres ! So of course I immediately had to google ‘Tim and Scott are rather strange”, but instead of taking me to http://www.lentmadness.org, it gave me all this drivel about some S. Carolina senator. How disappointing. but, reverse the names and you get a nice gold nugget ..
You guys rock! Bethlehem Evangelical Lutheran Church, Glenshaw, PA (near Pittsburgh) representin’! Can’t wait to begin our rookie year! Of course. But the equally important ASH THURSDAY, as we note, is February 15. Ash Thursday? Ash Friday? When exactly DO you wash your face? After Tim and Scott’s video finished, Youtube briefly showed me two options for further videos .. cough, sorry .. not likely many would also see Sam Heughan (Outlander fame) making rude gestures with certain fingers alongside The Spitfire’s Fatal Flaw .. ooh, decisions, decisions .. I guess I need the practice for Lent Madness voting! Three cheers and an Alleluia! Here we go again with the annual Lenten merry-g0-round. Hi, Beverly! It was nice talking to you earlier! Sue, I hope you enjoy this as much as I have. Ashes to Go and then Ash Thursday – I can hardly wait!